Deutsche Bank and Commerzbank: banks-wedding sense? The policy is not loose, aiming for a Fusion between the German Bank and Commerzbank, to forge it into a national Champion. However, how useful such a wedding would be, and should not, in fact, the entire structure of the domestic banking industry to the test? Andreas Treichl, longtime head of the Vienna Bank, Erste Group, has summarized the Dilemma of the German banking industry recently: "The solution would be a merger of Commerzbank and Deutsche Bank, that would be just 'more of the same'. The solution would be a merger of the Deutsche Bank with the German savings banks." He was aware, however, that this will never happen, even if it "would be not only for Germany but also for Europe as a whole is a blessing". As a result of the merger, one of the largest banks in the world would be created, with sufficient financial strength for the German industry anywhere in the world, so Treichl. a merger of a private Bank with a public-legal institutions is in the rigid German banking industry, in fact, unthinkable. Even timid Attempts, such as the merger of a savings Bank with a private Bank in the zero years were prevented with relentless determination. Only within the three pillars, consisting of private, public and cooperative institutions, there has not been concentrations. Helmut Schleweis, Chairman of the Deutscher Sparkassen - und giroverband, reported immediately to speak and said that a merger of Deutsche Bank with savings banks would have no prospect of realization. "There are cultural differences. I can hardly imagine that such cultures come together." This would arise in the case of such a merger, a giant with over 70 million retail customers, the savings banks Finance group as the undisputed market leader in Germany with more than 50 million retail customers. a rearrangement of the Three-pillar-model that nobody trusts. A special feature in Europe, but the old structures on the financial market in countries such as France, Austria or Sweden, long since broken up. Nevertheless, the German Finance Minister, Olaf Scholz, argues for a merger of the two remaining large banks. Officially, he says, of course, but he repeated again and again his desire for a "strong German Bank". It is important to have a strong banking sector, to be able to do what they can do national Champions. But what would a merger of Deutsche Bank and Commerzbank? Thanks to the economies of scale, the necessary investment in digitization would expect. 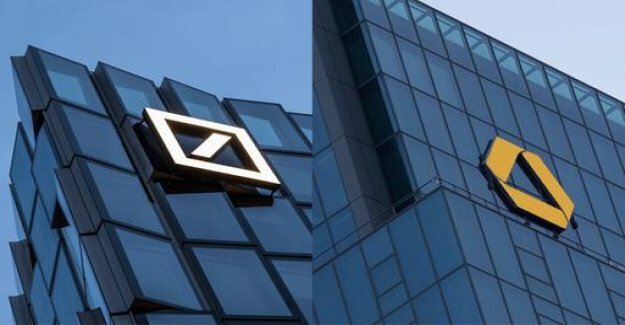 Together, Deutsche and Commerzbank would have 32 million customers, so they remained in Germany, the number two to the savings banks. In business with medium-sized and large corporate clients you would expand your supremacy. More rates But at what price? A merger would cost many Thousands of jobs, new billion, devour, and both institutions over the years, cripple. Both houses already know how difficult it is to realize the smart consultants calculated the cost savings actually. Commerzbank had swallowed at the beginning of the financial crisis, it acquired Dresdner Bank, even if the Federal government would not have resorted to under the arms. Up to today, lagging behind both of the houses behind most of its European competitors remained. Even ten years after the end of the financial crisis, they still suffer from high costs and a measly rate of return. So Deutsche Bank had to spend in the past year, and 92.7 cents, to earn a Euro. Competitors such as the Paris BNP Paribas took them only 60 cents. Also, Commerzbank is continuing the fight with a in a European comparison, the US banks, not to mention low yield. JPMorgan Analyst Kian Abouhossein makes a merger at the present time, no sense, because it would improve profits in the short term and lead to higher capital requirements. In five years, could the fall in refinancing costs, the profits of the merged can group by a meager six percent. Not in vain, Deutsche Bank head Christian Sewing has a Fusion in the next twelve to 18 months. And also in the vicinity of Commerzbank-Chef Martin Zielke is warned of the complexity of the task. Added: professionals believe that not a few private customers would leave the merged Bank. Because many clients are, for example, quite deliberately, at the Commerzbank and not at Deutsche Bank. Also, the investors see a possible merger rather critical. The weeks since ongoing speculation could not boost the share prices of the two houses. On the contrary, After the initial recovery in January, it went significantly downhill. So both banks are on the stock exchange just once a 23.5 billion Euro value. On the rankings of the world's largest money houses they are between the age of 40. and 50. Place. Two Lame show together not a Sprinter.